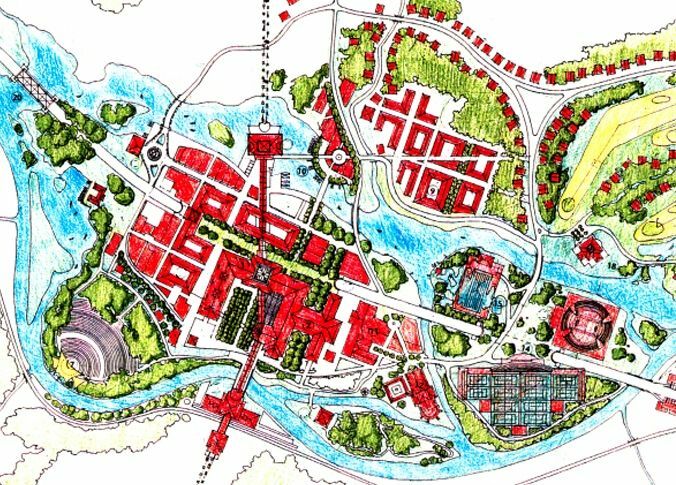 This masterplan was awarded 2nd prize in the 1992 Ford Foundation Environment Awards for town planning & architecture held in Vienna out of 680 international entries. Based on a need to attract international tourists and foreign currency, the government of the day decided to capitalise on the natural beauty of this region by establishing a tourist town. The site is located in the Lower Tatry mountains and boasts some of the best powder snow in central Europe during winter, horse riding and trout fishing in summer and a natural therapeutic spa source, similar to that found at Perrier in France but at 63 deg C on which to base a spa resort. The masterplan lent heavily on medieval planning principals, allowing only foot traffic and small carts and horses into the resort village, keeping all vehicles below ground in a subterranean service level. The resort village includes a 250-room 5-star spa resort, a 50-room boutique resort, a 125-room 4-star hotel, a bed and breakfast accommodation and backpacker accommodation. The village provided access to the tourist population to tourist retail, public services and resort sports for all seasonsÂ into some of the most spectacular scenery in Europe. The government planned to use profit generated from the village to remodel existing toxic paper manufacturing factories located in Ruzemberok on the Vah River, making them environmentally safe to clean up the river which at the time was the most polluted river to feed the Danube River. The bund upon which the village is situated was made from neutralised municipal waste coated with a 3m layer of topsoil. This and other breakthrough environmental design features were responsible for this masterplan being so highly awarded at the time.